AthleticDirectorU and Athlete Viewpoint have partnered to develop original opinion research about various issues in college athletics. This inaugural study gathered data from a select group of approximately 170 directors of athletics, senior level compliance staff and conference commissioners to understand their views about the state of Men’s Basketball in light of the FBI’s probe and related trials regarding the sport’s recruiting environment. 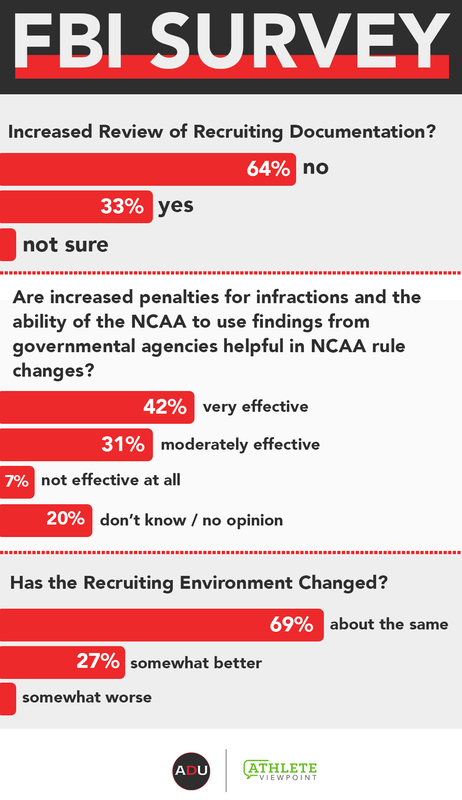 The findings include responses from every Division I conference and focus on rules implementation, rule change effectiveness and culture changes in the sport. Click here to view the full response data on Athlete Viewpoint’s platform and dig in further on your specific peer group. Be sure to note the category tabs in the upper left hand corner, as well as the “Conference Type” and “Role” options top-middle.